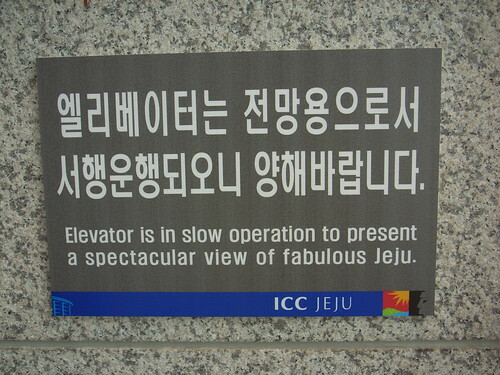 An interesting encounter yesterday at the conference center in Jeju is this sign, which reveal to the user why the elevator is so slow: it has been design for that purpose. Sort of the equivalent of "http://en.wikipedia.org/wiki/Slow_foodslow food" for micro-mobility transportation system. Why do I blog this? I find this sort of design (and signage) interesting as it shows how transportation systems are more than mere tubes to bring people from A to b as fast as possible. If quantity-management was the paradigm of transportation system in the past, there is now a clear trend towards more qualitative experience/service. That was a topic often addressed by Georges Amar, head of the foresight group at RATP, see for example my notes from one of his talk. Hence the need to slow down sometimes to appreciate landscape (in this case) or also sociability, the passage of time, etc.